David and the boys have been on a Lucky Charms kick lately. Back in the old days, I remember the ensuing hullabaloo when purple horseshoes were added to the mix. How could they even think of changing the classic marshmallow composition like that?! To make matters worse, they are trying to distract us with phrases like "Good source of calcium and vitamin D" and "whole grains." Three weeks of Lucky Charms for a bedtime snack inspired me to conduct a possibly frightening quasi-quackish-scientific experiment. Just call me a health nut. 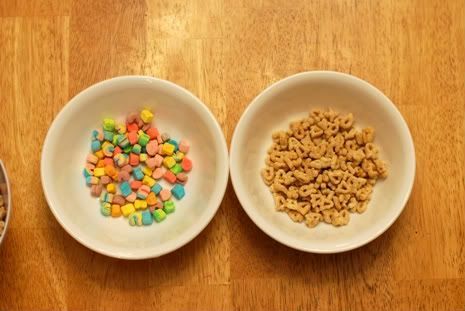 QUESTION: What is the marshmallow to cereal ratio in a typical bowl of Lucky Charms Cereal? HYPOTHESIS: Approximately 8 years ago, I conducted a similar test with Frankenberry Cereal. 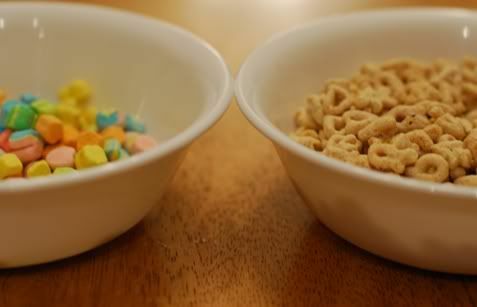 My hypothesis is that Lucky Charms will yield similar results of a 50/50 ratio of marshmallows to cereal. 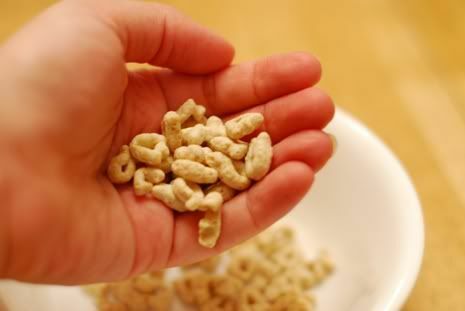 EXPERIMENT: Carefully separate the marshmallows from the "whole grain" cereal pieces, while exercising great caution as to not eat the materials. Hmmm... I wonder which bowl is hiding the "calcium and vitamin D"??? Halfway through the bowl, the ratio is neck and neck. 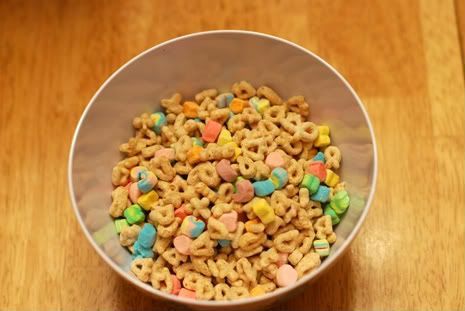 DATA ANALYSIS: My family's typical bowl of Lucky Charms contains more cereal than marshmallows. CONCLUSION: I hereby conclude that Lucky Charms is healthier than my initial supposition. Consumption of said cereal at the Drews house may continue. It's a lifestyle of learning, y'all. And you thought Saturday nights at my house would be boring! I bet you are totally kicking yourself right now. 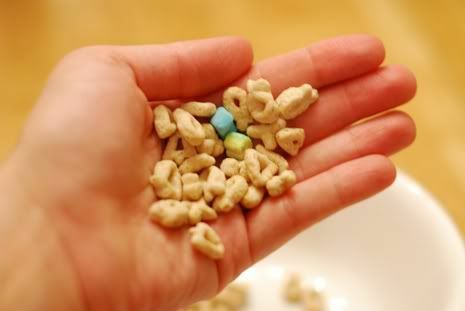 i really dislike lucky charms. i hate marshmallows. unless they are warm and smooshy inside a smore or melty inside a rice crispie treat. Haha how funny. I have only had Lucky Charms like once in my life. I would prefer an even healthier alternative of frosted flakes, but that's just me. :) Glad you had fun. LOL. You are so funny! haha! how funny! 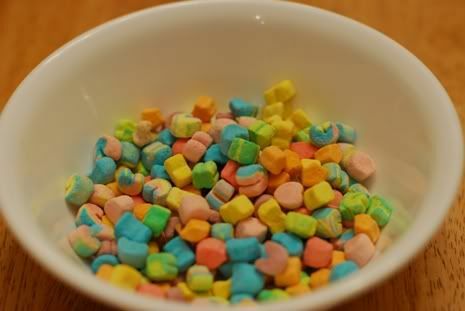 I used to just pick out the marshmallows cause the cereal is yucky! :P wish there were more marshmallows! Bobo- ha! that sounds like you are patting me on the head while thinking "bless your little heart"... that's my big sister all right... poor thing. Too funny! I enjoyed reading that. My kids think I am traumatizing them for life for not buying Lucky Charms. They seem to forget that I do buy all the other cereals they like--Trix, Cocoa Puffs, Cocoa Pebbles, etc. 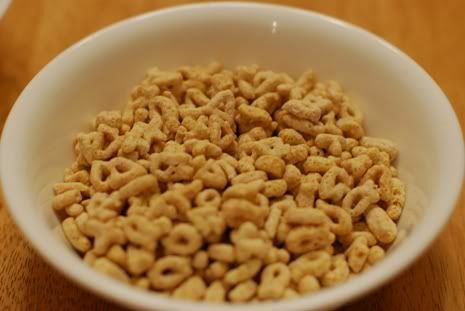 I just don't buy Lucky Charms because they only eat the marshmallows. I am really a Cinnamon Toast Crunch cereal girl myself. Oh and I really like Kellogg's Raisin Bran. The 6 boxes of Lucky Charms were consumed by the males in this household. We were at the amish grocery store last week and discovered that they sell just the marshmallows for Lucky Charms there! I never dreamed that some people would buy just the marshmallows, but maybe they like their marshmallow to cereal ratio a little higher. Ha! I've never liked Lucky Charms. 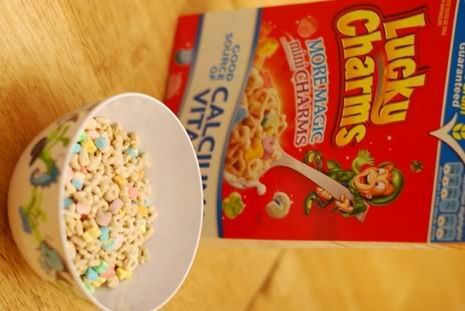 I like the cereal fine but don't like the marshmallows. I know I'm weird. Just hurts my teeth thinking about it. Love you!!! Michelle-- you are SO observant! I didn't even notice that. Humph... the deception and lies... next thing you know, they are going to say that it reduces cavities! Ha! Why is cereal so expensive? I've always been a toast, bagel, English muffin, breakfast girl...Go CARBS! Funny stuff! 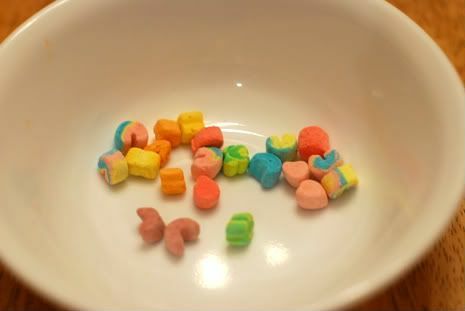 When I ate Lucky Charms as a kid, which would have been rarely, I would eat the cereal first saving the marshmellows for last. I wouldn't let Peyton eat cereals like that but his grandma bought him some Capn Crunch once. I would let him have it has a snack. There was some left in his bowl with a little bit of milk, several hours later it had dissolved to nothing. What was in that stuff!!! Thanks for the laugh this morning. You made me laugh .... I would never have thought of doing that! AWWWWWW ....Send me a box so that I can give my opinion!!! I've never seen or tasted those things! My kids would go wild for them. Whew! What a relief! 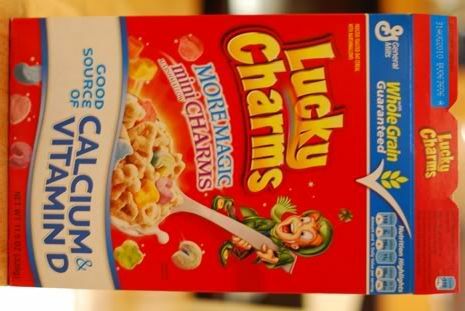 I guess I'll just have to add Lucky Charms to my grocery list next week, what with it being so healthy and all. Thank you for all you do in the name of science and learning. You are an inspiration...an inspiration, I tell you! Gotta keep yourself entertained somehow, and why not do it while LEARNING something! Way to go! Only you could make the random thoughts in ones brain look so darn good!